How to Solve "Windows Installer Service Could not be Accessed"
The error message may happen when Windows XP is in Normal mode and the Windows Installer Service in Windows XP is damaged or unregistered. It can also occur if the default authentication level is set to None in the DCOM permissions and the default Impersonation level is on Anonymous. The error might also occur if the Windows Installer is attempting to access a folder or registry key that the system account does not have Full permission to access, but this occurrence is only NTFS-specific. There are five specific methods used to fix the “Windows Installer Service Could Not Be Accessed” error message. The method to use depends on the specific issue. Before using these methods, verify that the service pack is installed. For Windows 2000, SP2 should be installed. For Windows NT 4.0, SP6 should be installed. The methods may not be effective if the appropriate service pack is not installed. Below is a list and description of the five methods used to fix the error message. Click Start then Run. Type MSIEXEC /UNREGISTER and click OK. It may look like nothing happens at this stage. Click Start then Run. Type MSIEXEC /REGSERVER then click OK. It still may look like nothing happens or an hourglass may appear. The method is complete. 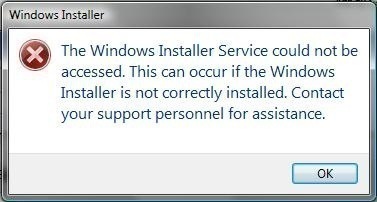 Attempt to use the Windows Installer application again. Click Start then Run. Type dcomcnfg and click OK.
Go to the Default Properties tab. Click Connect in the Default Authentication Level list. Click Identify and click OK in the Default Impersonation Level list. Click Start then Run. Type explorer /select, %windir%\system32\msisip.dll and click OK.
Rename the Msisip.dll file to Msisip.old. Reinstall the Windows 2000 Service Pack 3. Start Windows Explorer. Right click the computer’s root hard drive. Click Properties. Click the Security tab then Add. Click the SYSTEM account in the Select Users, Computers, or Groups dialog box. Click Add then OK.
Click to select the Full Control check box under Allow then click OK.
Click the TEMP folder and confirm that the SYSTEM account has full control. Methods 4 and 5 both entail using the registry. It is extremely important to back up the registry before completing these methods because there is a possibility that all files will be deleted when modifying the registry. If the registry is backed up, then the files will be safe in case an error occurs. Click Start then Run. Type regedit into the Open box. Click OK.
Click on this registry hive: HKEY_CLASSES_ROOT. Click Permissions in the Edit menu. Add SYSTEM to the Group or User Names list if it is not listed already then click Add. Verify that the local computer name is in the From this Location box. In the Enter the Object Names to Select box, type in system. Click OK. In the Group or User Names list, click SYSTEM. Under Allow in the Permissions for SYSTEM box, select the Full Control check box. Click Apply, click OK, and Exit the Registry Editor. Click Start then Run and type Regedt32. b. For Windows 2000 and Windows NT 4, click Permissions in the Security menu. For Windows XP, click Permissions in the Edit menu. Confirm that the SYSTEM account has been added and that the account has Full control. If the SYSTEM account does not have Full control, add the SYSTEM account with Full control. Start up the computer with Windows 2000. Click Start then Run and type regedit.exe. Run Instmsiw.exe for installer 2.0 again. 323 queries in 0.550 seconds.